Containment Protocols: RPC-666 is currently in Site 313 RPC-666 has breached containment. It is theorized to be in the proximity of the city of New York. RPC-666 must be contained in a reinforced steel cage, located inside a dome of 4 meters of a circumference. The walls of this dome are composed of three layers of 130cm thick stone walls. Inside, the dome must contain no less than two cameras monitoring any suspicious activity and an automatic food and water dispenser. The cage is to be cleaned weekly only by authorized personnel, with a protective suit which includes special glasses, aluminum-based helmet and a hazmat suit with reinforced aluminum that blocks waves sent by RPC-666. Any interaction with RPC-666 is strictly forbidden without Level-4 clearance to do so. Personnel in a close area of 30 meters must wear headphones at all times, outputting an audio source of personal preference. Personnel monitoring the cameras must not be looking for more than 2 minutes straight. The surveillance room is occupied with 2 members of MST-Victor-15 "Aluminium Head" for any incidents. All security and staff assigned to the surveillance are to be rotated every 8 minutes, as the anomalous effects start to act at approximately 9-10 minutes inside. There are a total of 5 teams to rotate shifts between. 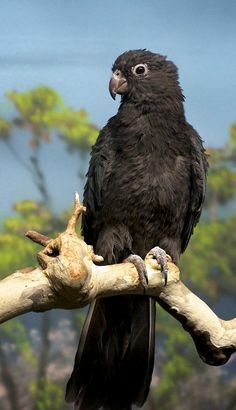 Description: RPC-666 appears to be a 2-year-old black parrot, belonging to the breed Lesser Vasa Parrot (Coracopsis nigra). It is capable of producing psychosis within subjects and is capable of producing other unknown anomalous effects. The entity has the body of an ordinary parrot. The only notable difference being its behavior as it is always steady or moving in a random pattern. It possesses high intelligence. It was able to escape its high technological jail when Incident 313 ocurred. It has knowledge of Authority code or intel potentially. The entity appears to speak alone when it is seen "sleeping", uttering short phrases such as "It comes." and "Did you forgot Your floaties?". RPC-666 can speak like a parrot, communicating in a loud disturbed tone. It is equally able to speak telepathically. The voice produced by the telepathic waves is a calm, comforting one that RPC-666 utilizes to attract the human specimens, which RPC-666 refers as Swimps. Its anomalous telepathic power can be stopped by metal at least 4mm thick. RPC-666 can wield the force of its "mind" to move objects such as a fridge weighing around 70kg, and exert enough force to crush a human skull. Entity has demonstrated to be capable of speaking directly to one person's mind and progressively corrupt an individual this way. It was also capable of predicting future events and "reading" an individual subject's mind. As for the unknown abilities, It will talk to an entity, referred to as "The Lord of the Deep", and will appeal for help. However, it appears to have a time limit as it can only call upon its favors once a week, being possible to call for favors if this entity is satisfied. Those events are given the name "Dark Swirls" by RPC-666. In those, 1-3 of the following outcomes can happen through the day. Clouds that can instantly age people 10 years for each second. Immediate Corruptions to RPC-666-A Stage 5 on people nearby water, this includes variants. Appearance of RPC-666-B in the walls, causing light flickering. Random teleportation to a pocket dimension for few hours. Rain coming from the roof, if the liquid touches the skin it will result in corrosion. Looking at RPC-666 for more than 5 seconds without eye protection(Dark glasses of at least 2mm or more) may result in visions and corruption of personal beliefs and ways of thinking. RPC-666 is capable of creating a memetic effect around it. Anyone within 30 meters of RPC will begin to hear voices. These voices grow louder over time and responding those voices will also activate the anomalous visual effects resulting and similar effects as observing RPC for five seconds. The person that proceeds with the actions mentioned above may receive stage one of corruption, once they get corrupted, they will slowly become a instance of RPC-666-A. The lower part of the body, including neck and bellow will get fully covered in the black skin, the head will stay clear, with no marks or dots, but the eyes will slowly turn dark and the pupils will become blue. The person will start to collect the items around it and bringing the closest to themselves and stay near the collected items protecting them. Their voices will appear to be lost. The person will start to get aggressive with anyone that comes close to the gathered items. It will attack and follow any person that comes close the gathered items until it kills the target. After that stage, the person will start sputtering, having convulsions and after 10 seconds, give the last scream before they fall dead on the floor. RPC-666-B: RPC-666-B is an approximately 1.7 meters slim dark blue creature. It appears to have no facial features. It is able to produce sounds similar to bubbling water. Instances of RPC-666-B will appear in the walls of humid places, but also being able to appear by teleportation in any places with aqueous substances close enough to it. RPC-666-B appear to have control over two main known abilities: Hydrokinesis and teleportation. These however may present other variations of those abilities like teleportation of other objects/life beings, and control of certain liquids such as blood and saliva. When appearing through the wall, RPC-666-B instances will most likely head to RPC-666's location and use any means necessary to release it from the cage. It appears to have high intelligence and is shown to be capable of outwitting Authority personnel in order to approach and defend RPC-666. RPC-666 was found on the island of Madagascar, Sainte-Marie after reports of a mass suicidal occurrence from drowning. The Authority picked up on these occurrences and sent an investigation team to collect information and confirm sightings of a possible anomaly. 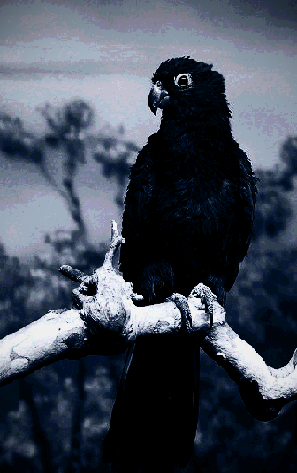 A research team was sent which reported a parrot, RPC-666, was found to be the only living survivor among the decaying bodies. The animal was taken in custody as an Alpha-White, as it could use telekinesis, but after a dark swirls incidents it was reclassified as Omega-Red. Foreword:RPC-666 agreed to an interview after negotiation with RPC staff. However, it said only both of them would stay inside the room. RPC-666 said the name of one of the researchers currently working on Site 313. It said that the interview would only continue with him. It is unknown how RPC-666 obtained the name. Many special NU Corp. telekinesis speech machines were created for that special occasion. Dr. J████ was transferred inside of a dome acting as containment for RPC-666. Dr. J████ appears to be using an aluminum hat and special glasses for the occasion. Dr. J████: Hello RPC-666, my name is Dr. J████, we will be doing the interview today, is there any name you would prefer me to use? Sound Machine of RPC-666: Petshop. Dr. J████: Sorry, I think I didn't understand that right. Petshop? Dr. J████: I still can't comprehend that. Why would that be? Dr. J████: We are, uh… Sorry? Dr. J████: Oh, So we are the so-called Swimps. What would that stand for? Swamp Wimps? Dr. J████: Then what would that mean? Dr. J████: Hah, why would that be our name? Dr. J████:That pool, I think all that water-related stuff got something to do with that pool, could you please explain to me what that pool is or what does it means? RPC-666: Madness… Deepness…I Miss… Home. Dr. J████: Right… What are instances RPC-666-A, the denominated "Corrupted." RPC-666: Swimps…True… form… Serve… Master. Dr. J████: W-What? Uh… And RPC-666-B, what are they supposed to "represent"? Swimps evolution? RPC-666: Wrong… Priests… of the… Deep. Dr. J████: Right… Lets quit the chit chat and tell me about that um, that Master. Dr. J████: Right. Watch the tone, one last question before the end this interview. Why you chose my name of all of the doctors? RPC-666: You hold… Great pain… Tries… To hide… Pain that great… too difficult… Not to see. Dr. J████: Ok… I… What are you talking about, you better watch it. RPC-666 Your… Glasses… May… Protect… You… It… However… Will not… Hide… Your… Soul. Dr. J████: You damn bird… I knew it were planning something, This interview is over. Closing Statement: Dr. J████ left the room frustrated, RPC-666 stayed still all day long with no activity present, only what could be presumed a "smile" coming from the same. Due to a failure to follow Containment protocols, [REDACTED] caused a rampage on Site-313 where it was contained at the time. After this event, Authority personnel were attacked by POI-███ in conjunction with what are theorized to be supporters. As a result of this RPC-███ was shot, damaging the protective suit around RPC-███ that rusted guns used in the process. This resulted in the subsequent loss of RPC-666, RPC-███-01, [REDACTED], and RPC-███. Currently, the whereabouts of RPC-666 are under investigation. Further details about this incident can be found on File [REDACTED]. Containment protocols have been updated and are to be enforced as soon as the asset is repossessed by Authority personnel. Or do you just enjoy the feeling of cycles? Living and repeating like the machine that you are? You want to change that don't you? I see… You wish to become one of us. If that is the case, come along child. Hush now, and repeat after me.